What would you cook with a 2 pounds bag of baby carrots? A carrot soup! So obvious, right? 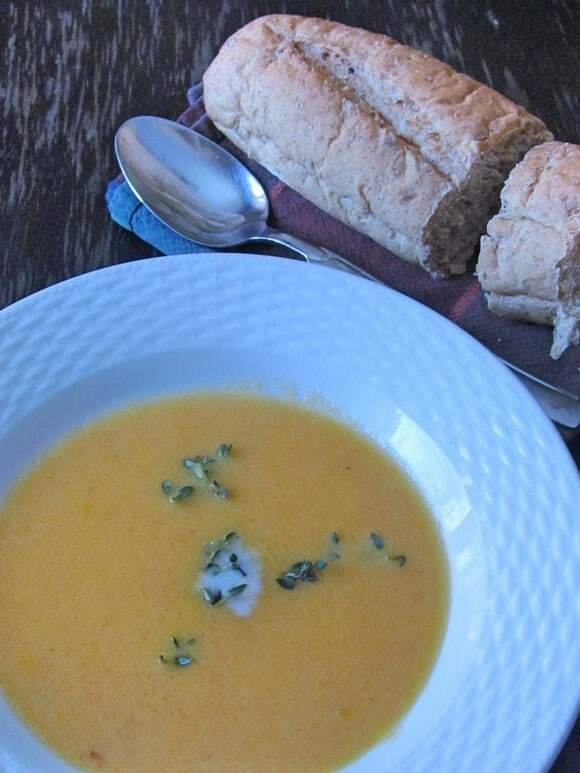 Check out my delicious carrot soup recipe and take advantage of the next sale on baby carrots! My husband went to the grocery store and he bought that huge bag of baby carrots! Huh! I turned red (or orange) when I saw that! Once the bag was opened, we need to eat the carrots within five days! Although my kids love carrots (a bunny would be probably jealous) they cannot consume that in 5 days! I went with a healthy soup to use that huge quantity of this vegetable! I usually cook this regular carrot soup but I found this new recipe that puts a spin and adds extra taste to the soup. The recipe, created by Joanna Tymnkiw, was in my local newspaper. 1 cup of sliced red onion. 4 teaspoon of chopped ginger! Optional: 2 teaspoons of curry powder. Add onion and sugar! Stir occasionally for 5 minutes! Let it caramelize and watch closely because you don’t want it to burn! Cover and bring to simmer for 30 minutes or until carrots are tender! 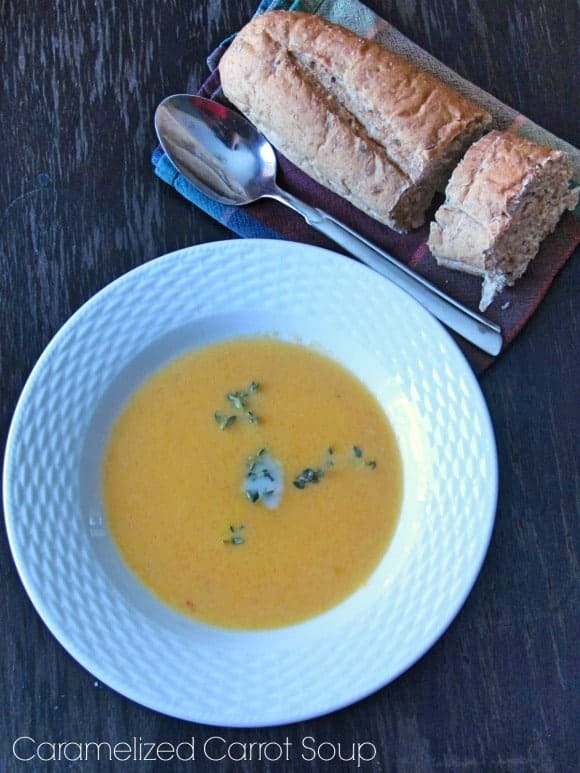 I served this carrot soup healthy recipe with some homemade garlic bread! Verdict: Delicious! The coconut milk added such a nice flavor to the soup! It was a huge success among the family! Since I had a huge quantity for carrots, I made a double batch and froze it in small quantities. It is convenient for those cold nights or for an after skiing day! What do you think of this healthy recipe? Have you tried adding coconut milk to your carrot soup? How was it? Cover and bring to a simmer for 30 minutes or until carrots are tender! This is a fabulous soup! Hope you are having a great day and thanks so much for sharing your awesome recipe with Full Plate Thursday. I love carrot soup – so yummy! Caramelizing vegetables is my all time favorite way to eat them. It brings out their sweetness… YUM! I found you through the Marvelous Mondays link party, and hope you’ll stop by ItsYummi.com to see what I shared for the party! This sounds so good!! I usually try to get rid of my carrots by making carrot cake, but I can only handle grating so many carrots. My carrot cake is not successful: can you suggest a recipe? I love this carrot soup: good!!! This is an awesome recipe,the best I’ve ever made!